Senior management at emerging premium bottled water company lay out plans to investors at the Fairmont Hotel in San Francisco. Event images, Fairmont Hotel in San Francisco. Last week, investors gathered at the iconic Fairmont Hotel in San Francisco to hear 480 Holdings Limited, LLC (“480 Holdings”) present and discuss their plans for a socially responsible, premium bottled spring water brand named Yaqara Water™ (“Yaqara”). Demand for bottled water has steadily grown as consumers around the world shift away from sugary beverages towards healthier alternatives.¹ A number of investors were curious as to how this company is going to differentiate its offering from other bottled water companies, given the strong competition from premium water brands including Fiji Water™, and how the company proposes to improve the lives of the local population. 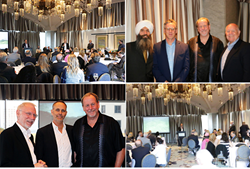 A lively discussion ensued with probing questions posed to the 480 Holdings team, including Bob Bishop, Founder; Patrick Scanlon, CEO; Ed Gawronski, CMO; Gobind Khalsa, CFO; and Brian Sudano, Board Member. The team outlined a business approach that is markedly different from that of their competition, with a commitment to renewable energy, stewardship of the adjacent rainforest, employment practices that include higher-than-market wages, and a firm commitment to contribute 1.0% of annual gross revenues to the 480 Holdings Humanitarian Fund to benefit the local Fijian people throughout the term of the firm’s 99-year land leases. Visit the company’s offering webpage to read more about its $15 million convertible note, or have a look at its presentation slides and Q&A transcript. Formed in 2015, 480 Holdings Limited, LLC is based in Tijeras, New Mexico. The company plans to bottle and sell premium Fiji natural spring water under the brand Yaqara WaterTM. CEO Patrick Scanlon has over 40 years of project management and marketing experience, with 18 years spent at Walt Disney Imagineering as Senior Vice President and more. The company’s Board of Directors includes Brian Sudano, COO of the Beverage Marketing Corporation, a leading expert in the beverage industry worldwide, and Douglas Holt, recently retired Vice President and General Manager of TaylorMade-Adidas Golf, who was responsible for $1.7 billion in international sales and brand management. Ed Gawronski, the recently appointed CMO, is an accomplished senior marketing executive experienced in growing high profile beverage and retail consumer brands. To learn more about 480 Holdings Limited, LLC or Yaqara Water, please email Gobind Singh Khalsa, CFO, at gobindsingh(at)480holdings(dot)com or call (707) 827-0108. ¹ DrinkTell Database with Market Forecasts, Beverage Marketing Corporation (2016). ² Addendum to EIA Report – Proposed Spring Water Bottling Project – 480 Holdings Ltd, Riley Consultants Ltd (2015). Since 1998, US Capital Partners has provided structured, custom financing solutions to private and public companies in the United States and abroad. Headquartered in San Francisco, US Capital Partners, operating with its affiliate US Capital Global Securities, LLC, is a full-service private investment bank with a wide distribution for debt and equity private placements. The group makes debt investments between $500,000 and $100 million, participates in debt facilities, and offers asset management, financial advisory services for buy-side and sell-side engagements, and capital formation, including early-stage financings of equity and debt. To learn more about US Capital Partners or about how your business can secure the investment banking services it needs, email Jeffrey Sweeney, Chairman and CEO, at jsweeney(at)uscapitalpartners(dot)net or call (415) 889-1010.